Brazilian Jiu Jitsu (known as BJJ) is a martial art and combat sport that teaches a smaller person how to defend himself against a larger adversary by using leverage and proper technique. There is no punching or kicking, like with MMA. BJJ training can be used for sport grappling in tournaments and in self-defense situations. In this class, you will learn basic movements, positions, transitions and submissions and escapes. No experience is required for Beginner or All Level classes. In Advanced Jiu Jitsu, the focus is on "sparring", rolling without specific instruction and practicing movements, positions, transitions, submissions and escapes in a less controlled environment. This class is for those with Jiu Jitsu experience and teaches concepts for a deeper understanding of moves and rolling. In Kickboxing (All Levels), students learn basic punches, kicks, movements and combinations. Members are paired off so each can work on both throwing punches and holding focus mitts. No experience is required to take Beginner Kickboxing. In this class, students build off of the basic movements and learn longer, more difficult combinations, as well as advanced punches and kicks, such as spinning movements and combos. Students also learn fighting strategies and concepts to prepare them for sparring or competitive kickboxing. Some experience is required to take this class. MMA is the opportunity to blend together what you’ve learned in the beginner’s classes in an advanced class setting. Learn how to easily transition from stand-up, to clinching, wrestling, cage work and grappling with punches. This class includes light sparring. Experience in both BJJ and Advanced Kickboxing is required to take this class. In our Kid’s Jiu Jitsu class, children as young as 3 learn the skills in an encouraging and fun environment. Our kids develop self defense skills and build confidence while learning patience, self control, and coordination. Our experienced instructors both demo the moves and roll with the children to prevent injuries and help each child learn at their own pace. Once the kids are comfortable, they are able to roll with fellow students of similar size and experience. Our teachers incorporate games, athletic tests and specific Jiu Jitsu moves to create a fun and enriching experience for all students. In our Kid’s Kickboxing class, children as young as 3 learn the fundamentals of kickboxing, including: punches, kicks, head movement and spatial awareness. Under the supervision of our experienced teachers, students play games as a group, as well as work solo to practice specific moves and balance exercises. 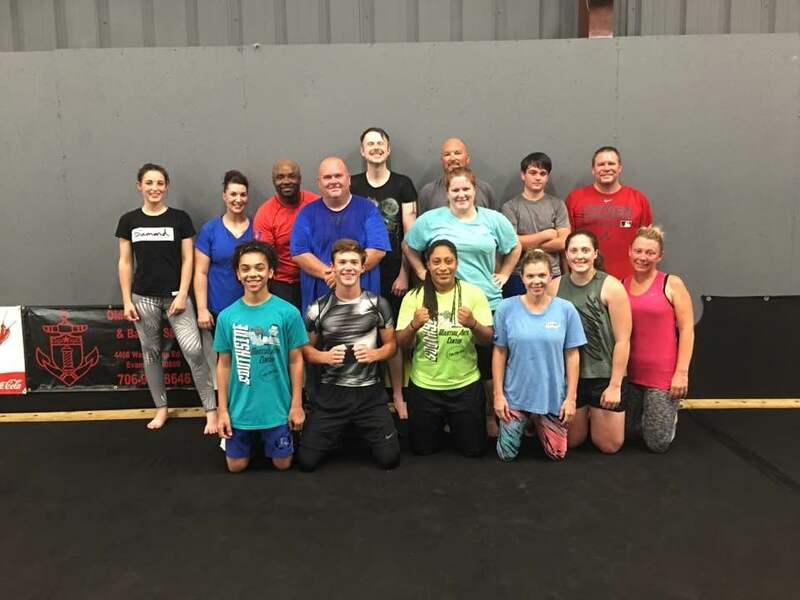 This class is designed to promote self-confidence, healthy competition, and an understanding of self-defense. All ages and experience levels are welcome in all of our kid's classes! Cardio Kickboxing blends together the multi-faceted training regime fighters endure: focus mitt and bag work with a partner, body weight exercises, explosive movements and stability work. The class is cardio based and most movements are done to increase the heart rate while some portion of the class will focus on building strength. All fitness levels welcome! One (1) Beginner Kickboxing class must be taken to take Cardio Kickboxing. Circuit Training includes many of the same training practices as Cardio Kickboxing, but with a greater focus on building strength and explosiveness. Dumbbells and body weight exercises are incorporated to create total-body strength, as well as agility drills. All fitness levels welcome! One (1) Beginner Kickboxing class must be taken to take Circuit Training.